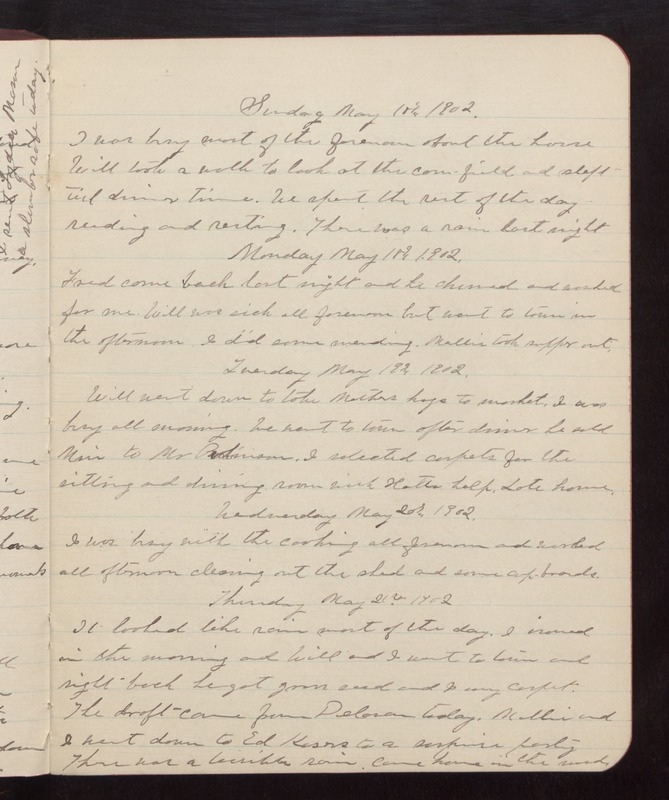 Sunday May 17th 1902 I was busy most of the forenoon about the house. Will took a walk to look at the corn field and slept till dinner time. We spent the rest of the day reading and resting. There was a rain last night. Monday May 18th 1901 Fred came back last night and he churned and washed for me. Will was sick all forenoon but went ot town in the afternoon. I did some mending. Mollie took supper out. Tuesday May 19th 1902 Will went down to take Mother's hogs to market. I was busy all morning. We went to town after dinner. he sold Min to Mr Robinson. I selected carpets for the sitting and dinning roon with Hatties help. Late home. Wednesday May 20th 1901 I was busy with the cooking all forenoon and worked all afternoon cleaning out the shed and some cupboards. Thursday May 21st 1902 It looked like rain most of the day. I ironed in the morning and Will and I went to town and right back. he got grain seed and I my carpet. The draft came from Delavan today. Mollie and I went down to Ed Kisers to a surprise party. There was a terrible rain. came home in the mud.